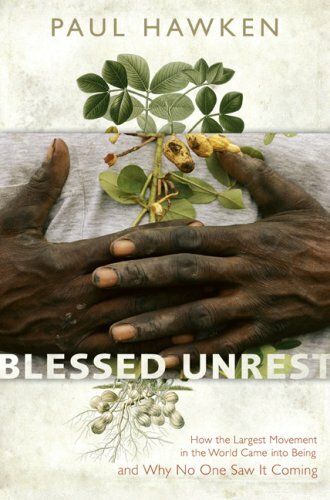 Blessed unrest tells the story of a worldwide movement that is largely unseen by politicians or the media. Hawken, an environmentalist and author, has spent more than a decade researching organizations dedicated to restoring the environment and fostering social justice. From billion-dollar nonprofits to single-person causes, these organizations collectively comprise the largest movement on earth. This is a movement that has no name, leader, or location but is in every city, town, and culture. It is organizing from the bottom up and is emerging as an extraordinary and creative expression of people's needs worldwide. Millions of small NGOs working to save the planet-- all with individual missions, goals and agendas. Can it be called a movement? Paul Hawkins believes it can. This is a comforting suggestion but I'm afraid the proof is whether the opposition sees this as a movement. I'm not convinced. really stupid book. Almost every sentence is invalidated by the next sentence. The author has become amazingly self-absorbed. Not a bad book for maybe high'school students who are completely ignorant of the world today and how we got here. Very inspiring and reassuring book. The world's really messed up, but their are millions of people working on solutions. Even better their shared environment is enough to produce a shared set of values, even though there's little communication between everyone. The beauty of self-correcting social systems. Couldn't get into it, sorry.